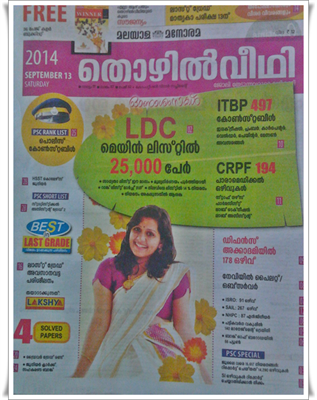 Malayala Manorama Thozhilveedhi 13th September 2014 issue (1st September) is now in stands. To read the latest issue of Malayala Manorama Thozhilveedhi dated 13 September 2014, buy a copy from your local book vendor. Thozhilveedhi from M M Group is one of the popular employment weekly which features updated news on arising opportunities in public and private sectors. Malayala Manorama Thozhilveedhi, one of the leading employment newspaper in Kerala has published its 13th September edition. The current issue of 'Thozhilveedhi' is packed with rising prospects in various fields. The 13th September edition of Thozhilveedhi comes with vacancies in opportunities in ITBP, CRPF, Defense Academy, Pilot/Observer in Navy, ISRO, SAIL, NHPC, Management Trainees in Scheduled Tribe and opening in Bank of Baroda. Added to the a variety of job prospects, solved papers of various exams and Last Grade Model paper prepared by Lakshya Academy is also featured in the latest edition. While going through the pages, readers can find 497 opening in ITBP, 194 in CRPF, 178 in Defense Academy, Pilot/Observer in Navy, 91 in ISRO, 267 in SAIL, 87 Engineers in NHPC, 140 Management Trainees in Scheduled Tribe and 55 Peons in Bank of Baroda. Other vacancies include fresh opening in Spices Board, KUFOS, Cochin Shipyard, Powergrid, ASRB, NHPC, Central Railway, Indian Oil Corporation, BPCL and job vacancies in Steel Authority and Central Electronics. Solved papers of Driver Grade II and Junior Clerk in Cooperative Society are published in the latest edition of Thozhilveedhi which would guide the candidates to check their progress in the exam. PSC Rank List Police Constable, HSST Commerce Junior and PSC Short List of Statistical Assistant Grade 2 are also given for reference. Lakshya Academy has yet again taken initiative to give out the last time preparation for the upcoming Last Grade exam. Crash coaching for K-TET, LP/UP, HAS, DEd & Pre Primary,/Nursery Teacher is published in the 13th September 2014 issue of Thozhilveedhi. Articles on various topics including LDC main list and appointment details about reported vacancies would give insight to the readers. Regular columns including PSC Interview schedule, Service doubts, PSC for beginners, Syllabus and Hall ticket details are given in the latest issue. Readers can get the maximum benefit from the new edition of Thozhilveedhi. This issue is accompanied by 'Competitive Winner', a free booklet which contains latest General Knowledge in capsule format. This booklet has guided the candidates in the past to score high marks and top ranks in various exams including Kerala PSC. 'Thozhilveedhi' has delivered extreme support to the youngsters and enlightened them to building up a strong career and gather immense knowledge.